The final day of the Wine Pleasures 50 Great Cava Tour found our intrepid group in Sant Sadurni d’Anoia, the epicenter and world capital of Cava. Our first stop was at the Centro de Interpretación de Cava – La Fassina de Can Guineu where we were able to learn all about Cava in the excellent self-paced multi-media touch screens. The interactive panels tell the story of the region and the history of Cava production. 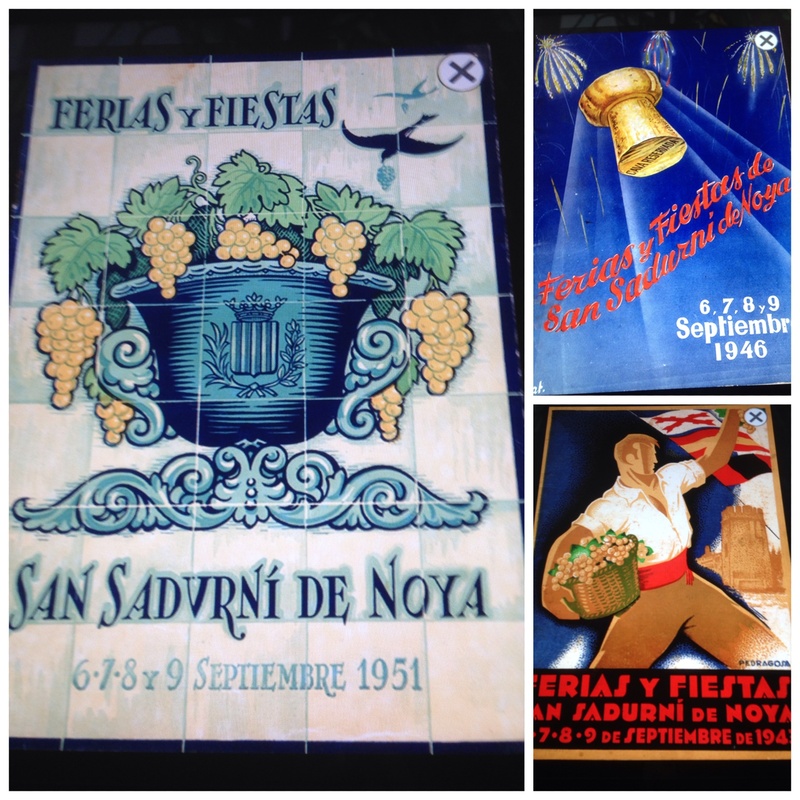 One of the most interesting sections depicted the many adverts and posters promoting Cava Festivals over the years. I think these posters, beautiful examples of graphic design, would make for great souvenirs. 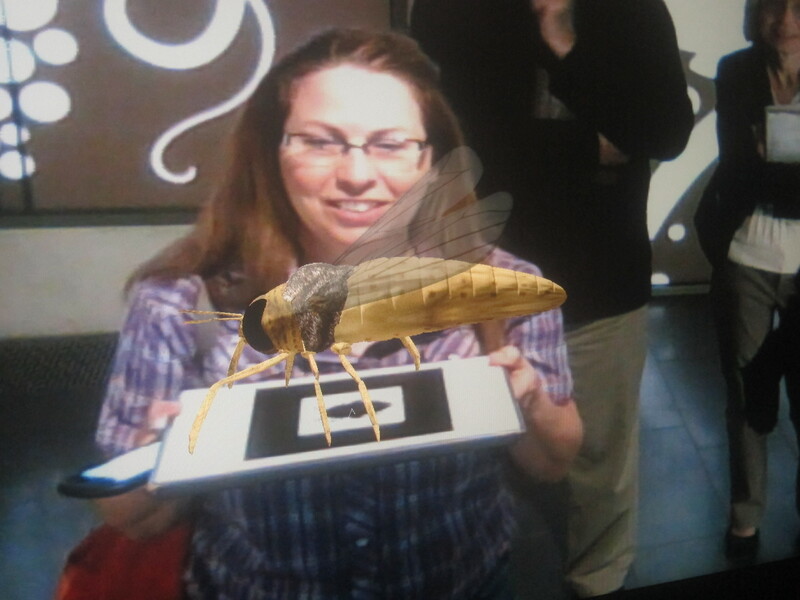 I wish the museum gift shop carried them. 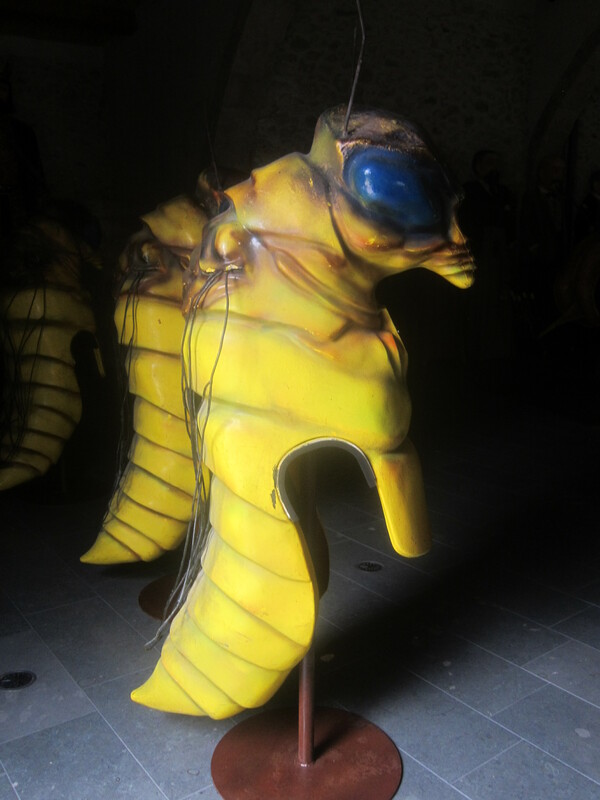 There is an entire exhibit room devoted to the phylloxera festival that’s held every September 7 & 8 in Sant Sadurni d’Anoia. A short film shows the annual Phylloxera Festival as it celebrates the tiny bug in a lively fashion. Part Mardi Gras style carnival, and part folk festival, the phylloxera is honored with a giant replica of the aphid and the whole town joins in a parade and revels in the streets with many people wearing paper mâché bug heads that are quite horrific looking. 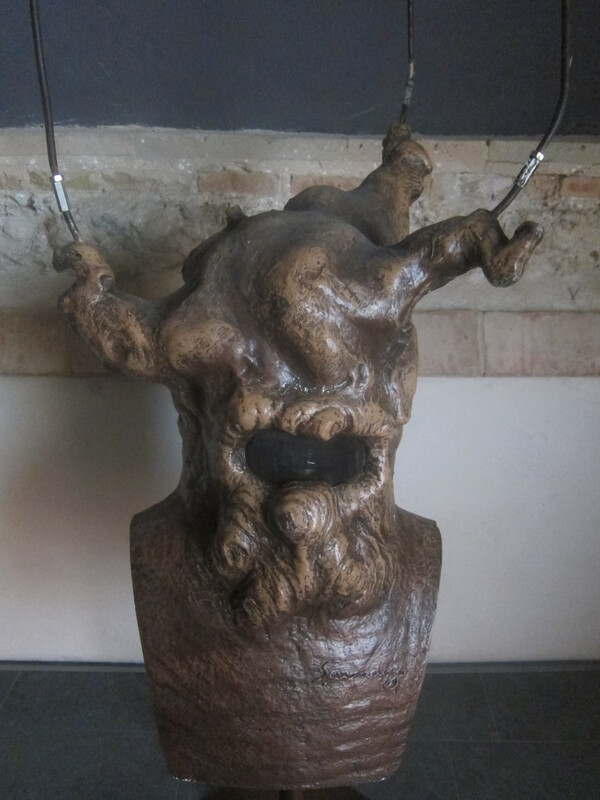 The exhibit also had examples of angry vine head masks that were gruesome and looked like the faces on the apple trees in the Wizard of Oz. Luckily for us we only had to trot up a few flights of stairs to a conference room where we tasted several Cava’s from the small artisan producer, Celler Vell. In the tasting line-up was the Estruch Brut Gran Reserva 2009, the Celler Vell Extra Brut Gran Reserva, and the Celler Vell Brut Nature Reserva –all awarded in the list of 50 Great Cava’s of 2014. 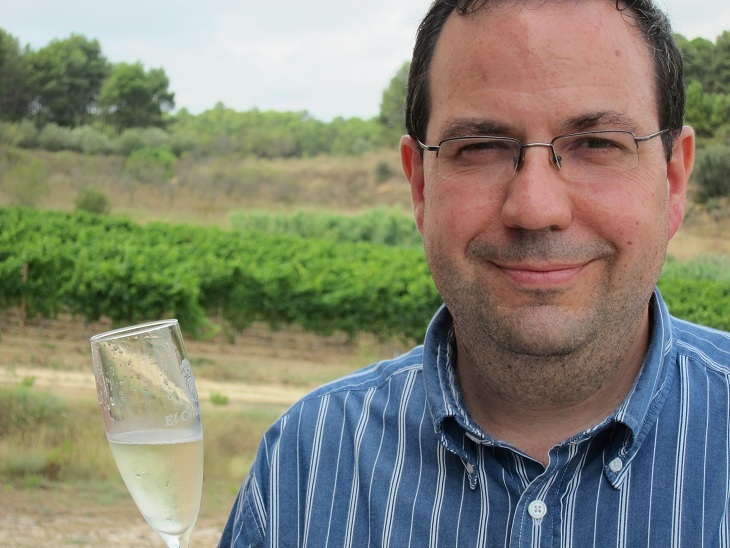 Next stop on the 50 Great Cava’s tour– Canals & Munné to view the cellars and taste the award winning Cava’s. 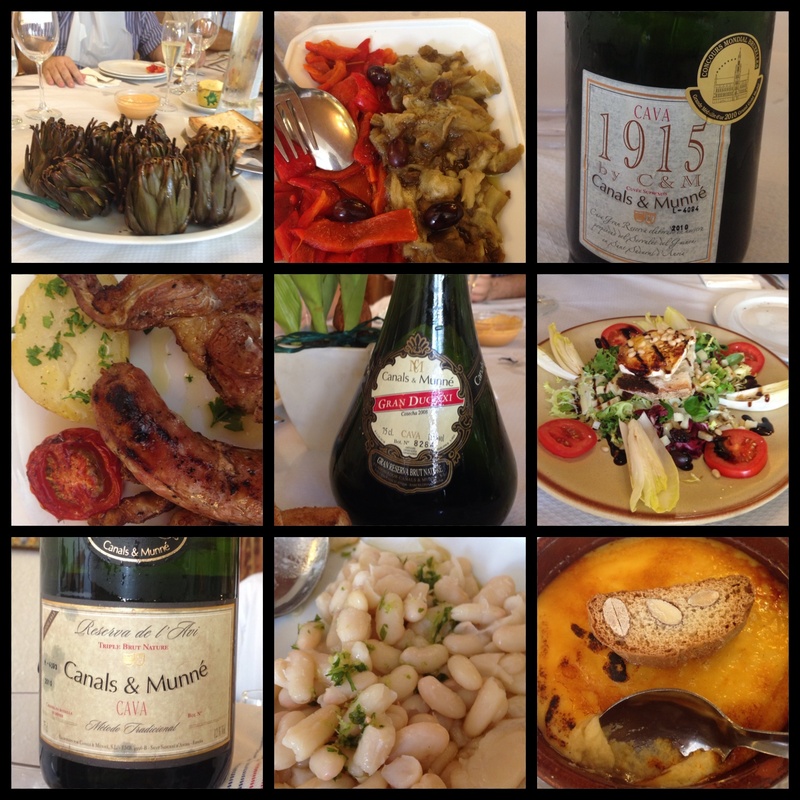 2015 will mark 100 years of Cava production at Canals & Munné and we brain-stormed a few ideas for the centennial celebration next year with export manager Natalia de la Calle Zancajo. Then we were given a tour of the facility and the charming Oscar Medina Canals demonstrated the manual corking equipment and showed us how the cage and cap was attached to the bottle. In the tasting room we tried several of the wonderful Cava’s including an organic offering, Dionysus Brut Nature, and my personal favorite the Insuperable a blend of 40% Macabeau, 30% Xarel•lo, and 30% Perellada—a lovely balanced Cava with a floral nose, bright fruit flavors, and a bit of spice on the finish. Afterwards we went back to the Cava centric town of Sant Siduru d’Anoia to the original location of Canals & Munné, which is now a restaurant and there we commenced upon a long lunch and paired traditional foods of the region with several more of the Cava’s. The highlight of the meal were the calçots –fresh green onions that are barbecued six minutes on each side, then the center shoot is pulled from the long green outer leaves, dipped in salsa de calçots and eaten by throwing your head back and dropping the onion into your mouth and hopefully not down your shirt. Fortunately plastic bibs were provided to keep everyone pristine. 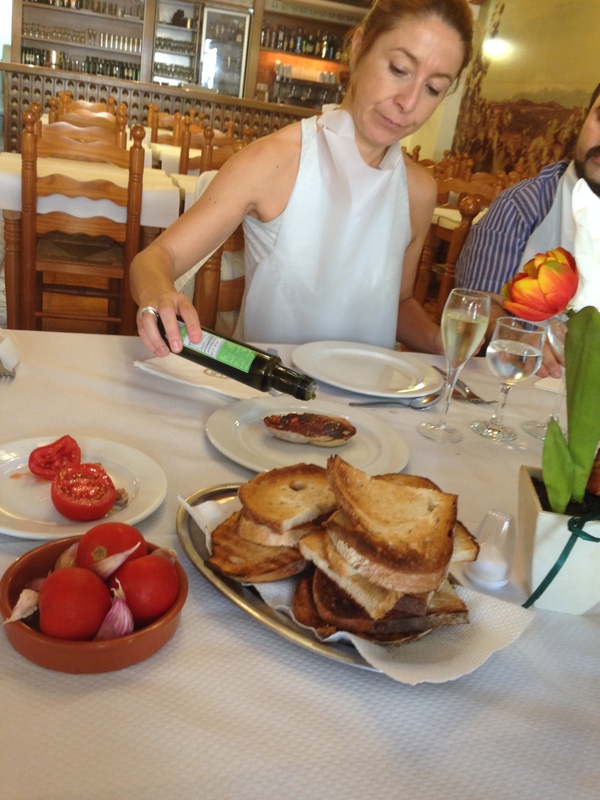 Natalia showed us how to prepare the traditional Catalan appetizer Pa amb tomàquet which consists of tomato, garlic and olive oil on fresh toasted bread. She cautioned us not fill up on too much before the main meal but it was hard to resist. In addition to the fabulous calçots, the lunch included plates of fresh salad greens, artichokes, white beans, roasted peppers and eggplant, lamb and sausage with potatoes and the signature dessert Creme Catalan. The wines served were the Canals & Munné 1915 blend of Pinot Noir, Chardonnay, Xarel*lo and Macabeu. Alos the Reserve de L’Avi, and the Gran Duc Cava in the distinctive flared bottom bottle. After the meal we had a grappa like digestive Marc De Cava made from the pomaces of the Cava’s. Thus with a toast and a salute we ended our meal and the 50 Great Cava tour came to a close. What a week it was.